Luna Tunes” was her nickname. 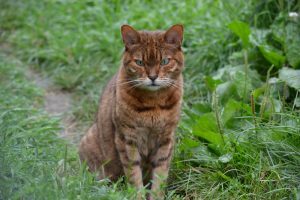 As one of the most vocal Bengal cats, Luna’s voice could be heard across Hybrid Haven. At 17, it was a little raspier than when she first arrived at the Sanctuary 11 years ago. It was her signature song and one we will now deeply miss. 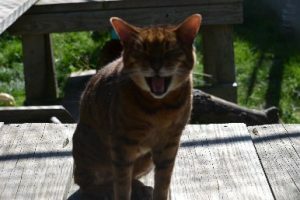 Luna, like many of our Bengal cats, was loved by her family but surrendered for territorial urination and also being picked on by their other cat. Specifically, Luna was urinating on the bed and her family while they slept. Over the years, they stayed in touch and even sponsored Luna, not something we often see. Luna was sweet from the day she arrived until the day she left. She loved people and her caregivers loved her back. She was showered with kisses and hugs, not only from her human friends but also from her bungalow buddies Ty, a Chausie cat, and Ledger, a Savannah cat. These big boys towered over Luna, but loved and protected her. It was a drastic diffe rence from earlier years. Since she’d been picked on at her former house, we tried having Luna live with blind Bengal cat Ciega, but Luna’s big voice became a little annoying to Ciega, and she would chase Luna up on top of the refrigerator. She couldn’t hurt her since Luna could get out of her way pretty easily. Luna would call from the refrigerator even louder down to Ciega, which just made Ciega swat her tail back and forth. Given Luna’s gentle nature, we thought she would do well with Spartacus who is handicapped from a birth defect. But he too got tired of Luna’s vocal antics and would chase her. That’s when Luna met big boy Ty. 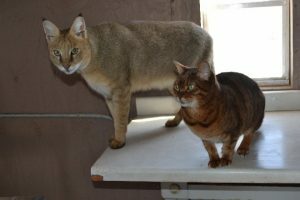 Ty is an FI Chausie cat and four times her size. Ty fell in love with Luna instantly and followed her everywhere. He didn’t seem to mind her loud demeanor and it didn’t deter him from loving on her one bit – whether she wanted it or not. Ledger, a very large F1 Savannah cat, also formed a quick crush on Luna. Soon, the three were inseparable and Luna was the center of their world. It remained that way until her departing day. Ty and Ledger are doing well and are staying close to each other since her passing. Luna had more than a good life, she had a great life and was loved by so many. She is luckier than most hybrid cats who move from home to home and then to a shelter only to be put down for territorial urination. Luna continued to mark her humans, claim her territory and sing her demands. But that was Luna and we loved all of her. Sing as loud as you want now Luna Tunes, the heavens welcome your song. We will love you always! Luna is a domestic Bengal cat. A nice couple had adopted Luna, but their existing cat was very aggressive towards her. Luna would hide and no longer wanted to come out. Her owners knew this wasn’t the way they had ever wanted her to live. They wanted to find a home for Luna where she didn’t have to hide. They found The Wildcat Sanctuary and, luckily, we had the space to take Luna in. Luna was born in 2000 and came here to the sanctuary in 2005. When she wants food, she is one of our most vocal cats, and that’s why she’s earned the nickname “Luna Tunes” from the Sanctuary staff. She lives in a fantastic enclosure for a Bengal cat. Luna has an indoor and outdoor area that has everything from trees, perches, caves, and dens to an in-ground pool. There is also a temperature-controlled, indoor building that provides shelter during the harsh Minnesota winters and warm summer days. She enjoys the company of several other cats in her enclosure, too. Luna’s days of hiding are far behind her. It’s a wonderful feeling knowing you’ve made such a difference in the quality of life for a rescued wild cat.